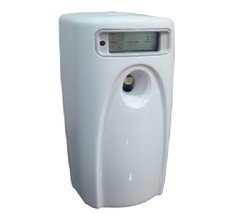 Leading Manufacturer of air fresher dispenser from Mumbai. Setting Durability The dispenser can be set to use the refill in 30,45,60 or 90 days. AUTOMATIC AEROSOL DISPENSER WITH LCD DISPLAYASA - 50LCDSPECIFICATIONS-White Color, Compact Size-The dispenser can be set to use the refill in 30, 45, 60 or 90 days.After setting, the ‘days to refill’ counter will count down to 00 days.00 will be blinking to remind the user to put a new refill.